Makobo Modjadji, the rain queen who led South Africa's Balobedu people, has died aged only 27. It is not known what killed the rain queen, who was crowned in 2003 at the age of 25. She was the sixth and youngest queen in the history of the tribe, and the first to be formally educated. Makobo Modjadji was descended from a female royal line stretching back more than 200 years, and was said to have inherited magic rain-making powers. The Balobedu tribe is one of few in Africa to take its leader from a female line of succession. The Balobedu believe their queens communicate with the gods and pass down magical powers allowing them to create rain. "She is an agent of god and the gods are our supreme rulers and her rain charms work in conjunction with their will, a will she cannot override," said royal spokesman Mathole Motshega to Reuters in 2003. The powers were feared so much that the wars raging between nearby tribes left the Balobedu in relative peace for centuries. Makobo Modjadji followed her grandmother, Mokope, who died in 2001 at the age of 64. She combined the traditions of the tribe with certain modern habits. She was fond of soap operas and could often be seen chatting into her mobile phone. She became friendly with former South African President Nelson Mandela, who once gave her vehicles to help reach her remote home. 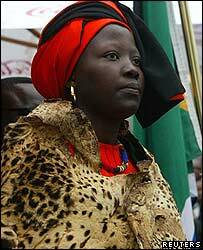 The Modjadji Royal Council confirmed her death in hospital at the weekend, but did not say how she died, the South African Press Association reported.